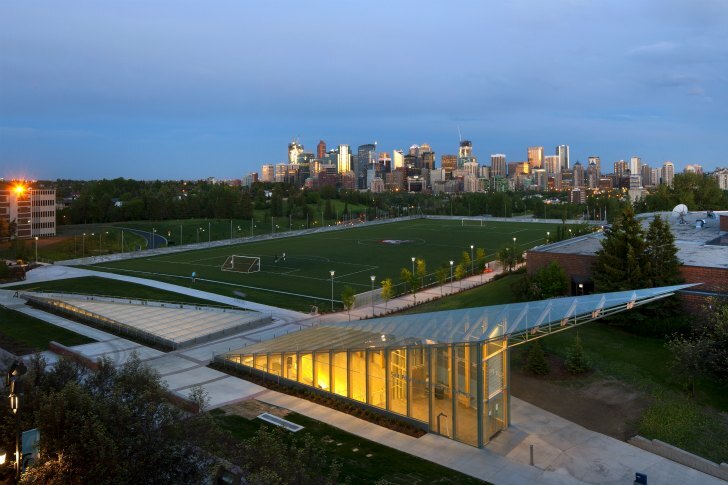 Hidden under the green roof soccer field where the Southern Alberta Institute of Technology (SAIT) Trojans play all year is a three-story parking garage. Nestled into the hillside and wrapped in a perforated metal screen, the Bing Thom Architects-designed SAIT Parkade is as unobtrusive as it gets. On top of the parking garage, uber low-pro, the natural-ventilation encouraging metal screen features a beautiful design of billowy clouds by Vancouver artist Roderick Quin. 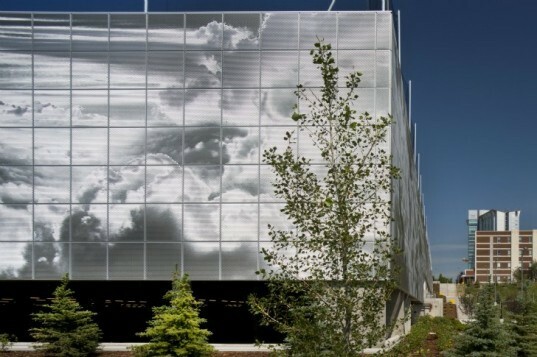 The giant piece of art is practically unknown, but is a hidden gem that interacts with the sunlight and helps the parkade blend in with the sky. Bing Thom was asked to design a parking structure for the university that wouldn’t take up valuable campus space, but would also centralize parking and help reinvigorate the campus. The solution was to place the parking garage underneath the existing playing field, burying the garage partially into a hillside. This places the playing field on the same level as the gothic Heritage Hall – one of the centerpieces of the campus – so that the building does not obstruct views of the historic 1921 building. Soaring twin glass pyramids rise up from the garage, providing and atrium and staircases down into the parking levels. The east and south facades of the garage are left exposed to pull in natural daylighting and ventilation in order to reduce energy use from mechanical systems. To facilitate the ventilation and daylighting, but also make the structure more aesthetically pleasing, a giant metal screen encloses the parking garage. Artist Roderick Quin and his company Ombrae oversaw the design and fabrication of the metal shade screen. Thousands of holes are strategically punched through the metal creating a giant pixelated art work that depicts and blends in with the Alberta sky. “Through our design, we tried to humanize what might otherwise be just an enormous, soulless structure,” Bing Thom explains. “What we’ve done, essentially, is turned a quotidian building type into something that becomes part of the landscape in a simple and elegant way,” states Thom. As a soccer/football fan, this is an absolutely wonderful idea! I'm going to forward this my university, I'd love to see if this inspires them for the next giant parking structure they build. Bing Thom was asked to design a parking structure for the university that wouldn't take up valuable campus space, but also centralize the parking and help reinvigorate the campus. The solution was to place the parking garage underneath the existing playing field, burying the garage partially into a hillside. This places the playing field on the same level as the gothic Heritage Hall – one of the centerpieces of the campus – so that the building does not obstruct views of the historic 1921 building. Soaring twin glass pyramids rise up from the garage, providing and atrium and staircases down into the parking levels. The east and south facades of the garage are left exposed to pull in natural daylighting and ventilation in order to reduce energy use from mechanical systems. To facilitate the ventilation and daylighting, but also make the structure more aesthetically pleasing, a giant metal screen encloses the parking garage. Artist Roderick Quin and his company Ombrae oversaw the design and fabrication of the metal shade screen. Thousands of holes are strategically punched through the metal creating a giant pixelated art work that depicts and blends in with the Alberta sky. From above the playing field is clearly visible, but it is not nearly as obvious that there is a parking garage below. “Through our design, we tried to humanize what might otherwise be just an enormous, soulless structure,” Bing Thom explains. “What we’ve done, essentially, is turned a quotidian building type into something that becomes part of the landscape in a simple and elegant way,” states Thom.